Hotel Eurocongressi, Cavaion Veronese. Eurocongressi Hotel Cavaion Veronese. 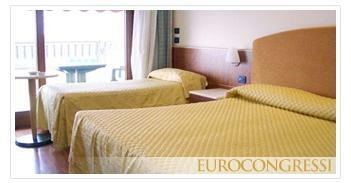 The Eurocongressi Hotel is the ideal place to organize events and reunions. It is at only 5 kms from the weel-known Lake Garda, at short distance from the main attractions such as Bardolino and Lazise and at 20 kms from Verona, Romeo and Juliet's city.